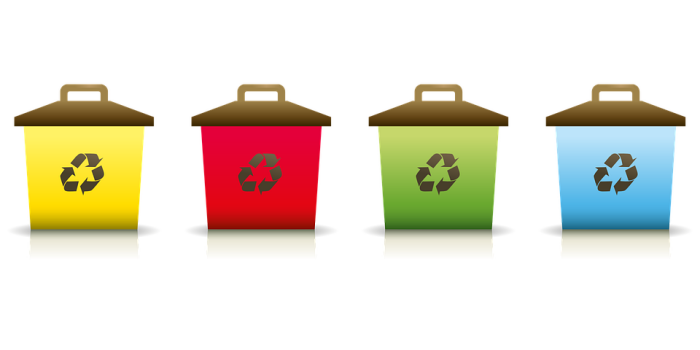 Keep America Beautiful: Celebrate America Recycles Day - Planet Aid, Inc.
America Recycles Day, celebrated November 15, is an important day to stop and think about how much we consume during our daily lives in comparison to how much we recycle. It’s also a good time to reflect on what you can change in your life to reduce that consumption and increase how much you recycle. The environmental benefits of recycling are practically endless; recycling reduces the amount of waste sent to landfills and combustion facilities, conserves natural resources, prevents pollution, saves energy, reduces greenhouse emissions, and so much more! Each year in the United States, the amount of municipal solid waste (MSW), commonly known as trash, continues to increase, while the recycling rate, for the most part, stays flat. In 2014, about 258 million tons of municipal solid waste (MSW) was generated. 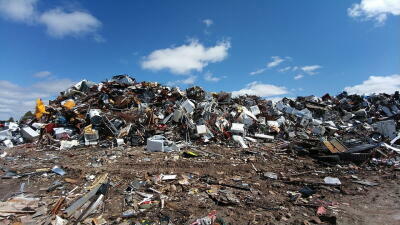 Of that, only 89 million tons of MSW was recycled and composted, an equivalent of 34.6 percent. This number of MSW generated represents a 4.5 million ton increase from the previously published data for 2013. Globally, America is ranked seventh when it comes to recycling, a staggering ranking for one of the most developed countries in the world. So, why does this number seem so low? Since fast fashion has taken the fashion industry by storm, Americans are buying more and more clothes each year. Fast fashion is a relatively new trend, in which clothing companies introduce new styles at a much higher frequency than what used to be considered a more traditional seasonal pace. This concept attracts consumers to buy more because the clothes cost less (due to where and how it is produced). Unfortunately, the clothing has much less quality, meaning that consumers are shopping much more often, as clothes begin to fade, rip, and seem worn after only a few wears. What makes this trend even worse is that Americans simply are not recycling their clothes as much as they should be. 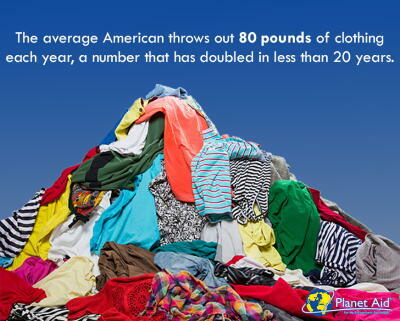 The average American throws out 80 pounds of clothing each year, a number that has doubled in less than 20 years. Only 16 percent of the clothes we consume over the year are saved, with 84 percent wasted (sent to landfills or incinerators). Planet Aid works to divert more textiles from ending up in the landfill by making our recycling bins as convenient as possible. Click here to find a bin near you. Wasted food is another growing problem in America. A Guardian report released last year showed that roughly 50 percent of all produce in the United States is thrown away—some 60 million tons each year. According to the EPA, food waste is the single largest occupant in American landfills. One of the main causes of this waste when it comes to produce is that some of the products simply won’t get picked to be sold because it’s “not pretty enough” meaning it’s bruised or has an odd shape, something consumers tend to avoid when it comes to buying their produce. Dana Gunders, a staff scientist with the Natural Resources Defense Council (NRDC) suggests another cause for food waste is the confusion with dates placed on items. “Your ‘use by’, ‘sell by’, ‘best by’ dates—those are generally not federally regulated—nor are they meant to tell you that your food has gone bad or that it’s unsafe to eat. Most of those dates are just manufacturer suggestions for when the product is at its very freshest. The problem is that people think the dates are telling them to throw food out and so they do,” Gunders explained. This amount of food waste is concerning, not only to the environment, but also to the hunger problems that exist not only America, but around the world. The world produces enough food to feed everyone, yet, 11 percent of the global population (815 million people) is still affected by hunger. Be realistic: If you’re only a two-person household and the recipe is for six servings, reduce the amount of ingredients you use so that you don’t have an excess of leftovers. Be a conscientious shopper: Use a shopping list or an app so that you have clear instruction on what you do/don’t need. Before checking out, take one last look at your cart to make sure you aren’t buying anything that you may not eat. Expiration dates: Take them with a grain of salt. The dates are typically there as a recommendation for when the product will be at its best quality. In most products, a few days past that date won’t hurt you. However, be careful of mold, spoiled meat, etc. Donate: If you do find yourself cleaning out your pantry and find non-perishable goods that you are going to throw out, donate them instead. Contact local organizations to see what they accept and how you can donate your items. There are many reasons why people don’t recycle. Some people don’t have convenient access to recycling bins, some may believe it’s too much of a hassle, and others may just not care. Some researchers believe, however, that there is psychological reason behind why people don’t recycle. Jennifer Argo, a marketing professor in the University of Alberta’s School of Business, says that humans are psychologically wired to believe that anything damaged is useless. Therefore, damaged products or products that aren’t whole — such as ripped paper or dented cans — often times end up in the trash rather than the recycling bin. During a study that was performed, Argo and co-author Remi Trudel of Boston University, found that when a recyclable item ceased to retain its whole form, participants demonstrated an “alarming tendency” to throw it away. Social psychologists have found that not only do we worry about other people’s recycling habits, we also worry what other people think about ours. Meaning ifwe see that a family member, friend, coworker, or neighbor isn’t recycling, we may not recycle either, out of fear of being judged. This power of influence works the same way with seeing that friends, family, coworkers, or neighbors are recycling and would feel more inclined to do so, as to not feel like an outcast. The good news is, even with these psychological factors, there are ways that you can change the way people around you think about recycling. For example, engage and motivate people in your life to purchase green products and to help reduce waste, and encourage neighbors and your community to recycle by creating a community drop-off site for recyclables if one already isn’t established. Recycling is a global effort and it’s important that we put the pressure on those around us to recycle often and effectively.